Dit stuk schreef ik vorige week in Brussel voor Radio Netherlands Worldwide. “Kagame! Murderer! Kagame! 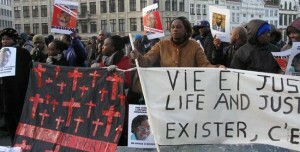 Murderer!” Hundreds of Rwandans and Congolese demonstrated in Brussels last week. They were angry that President Paul Kagame was invited to the European capital. But the demonstration was in vain – Brussels and Kigali remain close friends. “The president of Rwanda is a criminal”, said Paul Rusesabagina, the famous manager of Hôtel des Mille Collines who was among the demonstrators gathered on Albertina square in Brussels. Brussels is proud of the progress Rwanda has made since the 1994 genocide. During the European Development Days in a heavily secured congress centre, the Rwandan Minister of Foreign Affairs, Luise Mushikiwabo, spoke of the equality of men and women in her country. Mr Van Baalen thinks this conviction will be proven false. 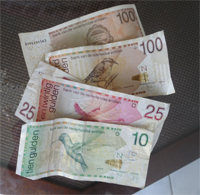 And the Dutch government feels the same: The Netherlands will not send direct financial aid to Rwanda in 2011. “The government doesn’t want to donate money to a country in which human rights are being violated and where there is a lack of democracy.” Another cause of concern is the trial against Rwandan opposition leader Victoire Ingabire. But according to British member of the European parliament, Michal Cashman the Netherlands is wrong. “Where is the evidence? We’ll have to be careful with accusing Rwanda,” he said. “The word ‘genocide’ is being used far to easily in Eastern Congo. Rwanda has known a genocide and wants to prevent that it will happen ever again.” Therefore Brussels should keep on supporting Rwanda, is the opinion of most politicians in the European capital. Meanwhile the demonstrators in the centre of Brussels leave the square full of disappointment as they are sent away by police. They take their boards and banners and go back home. President Kagame did not hold his announced speech during the European conference. He left early to Rwanda for more pressing issues. His minister of Foreign Affairs replaced him and thanked Europe for all its support. This entry was posted in Afrika, België and tagged Afrika, België, Brussel, Engels, politiek, Reportage, Rwanda on 18/12/2010 by Sophie van Leeuwen.